Did you ever wish for a cordless telephone with extra big buttons? The Geemarc standard range PhotoDECT is the answer! 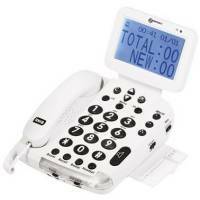 The base of this cordless telephone has 10 large direct dials that can be customised with writing or pictures. Calling out cannot be easier: all that is needed is to pick up the handset and press one of the pictures to be connected, making this an ideal phone for all those with limited dexterity, visual or cognitive impairments. With amplification of up to 22dB, the PhotoDECT is also very easy to hear and is therefore ideal for all those with mild to medium hearing loss. Features include big, backlit buttons and a large, bright, backlit display on the handset; caller ID on both handset and base; a loud handsfree speaker phone; a very loud adjustable ringer; a variety of ringing melodies and ringtones and a phone book with up to 50 names and numbers. The extra bonus? Several PhotoDECTs can be linked to the same base unit to allow you up to 5 different telephones in your home  with one single telephone socket. The PhotoDECT is the ideal solution for all those who want an advanced device with many features that is simple, stylish, and very easy to use. Geemarc telephone for the visually impaired. Different tactility to the buttons  touch and feel!